The last day of term here at Prendergast Ladywell School was a great way to celebrate our success and be mindful of people less fortunate than ourselves. The students and staff of PLS raised an impressive £725 through paying the £1 for the privilege of wearing non-uniform. This amount was shared between two good causes (Crisis at Christmas and KORI). 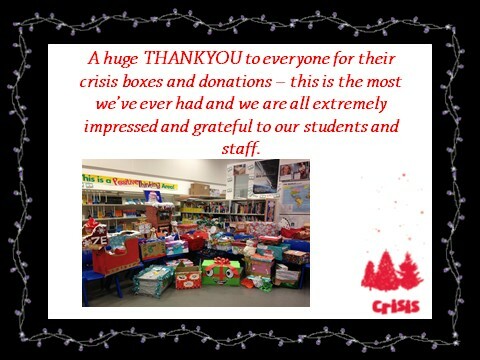 An in-school competition saw a fantastic array of well-designed and filled boxes for Crisis for Christmas and local food banks. We also ran a brilliant 'bake-off' competition, which saw impressive entries from both teachers and students. The cakes were then sold at break time, further boosting our charity donations. The Leathersellers have very kindly agreed to "match fund" our total collection, which means that each charity will be receiving over £800 from Prendergast Ladywell School this Christmas.